(When BarterCorp was sold in 1999 to Intagio, Doug Dagenais became the new National Sales Manager handling their retail and national accounts. He also took over management of the Chicago Corporate owned location. In 2003 he left to build the barter division of Shell Vacations Club. There, he coordinated $1 million annually in room-night trades with many exchange groups as well as direct vendor transactions. As we all attempt to manage and grow our business, sometimes we�re challenged in finding the way. For a barter network, when it comes to new account registrations�the key to growth�losing the way can be devastating. We search for prospects by networking, cold calling, advertising, getting referrals, and talking to anyone we know. It�s much like the advertising industry in the past, promote your products to everyone and see what sticks. This approach has passed by in the advertising industry and it should have passed us by as well. Target Market Segmentation has proven to be the most cost effective approach to growing a business. This means defining the market that your core business works well with, and messaging your products/services to those targets through the medium they respond to. A simple statement, but it has a host of implications to the barter industry. Defining the market: What business are we in? One of the great opportunities about our industry is that barter can be applied to most every business. This is also one of our great challenges. What customer do we serve and serve well? What customer segment do we have the resources to support? Small business services? Mid market manufacturing? Media? Travel? National accounts? All of these? My experience tells me that we build communities, no matter what industry or size business we serve. Communities based on a clients� needs and offerings. If we move in this direction, it results in an immediate transaction, benefit to our customer, and an urgency for the prospect to move forward quickly. No matter what segment we choose, we need to be focused on filling the customer needs. If our prospecting carries us outside of this, we�re taking the wrong direction and need to look at our map. Core business: Once we define our market segment, can we define our core strength in serving that market? Do we focus on supply chain transactions or ancillary expense categories? Are we in the membership business or are we creating one time transactions? When we define our core business, we best understand how we can serve customers and can thus, in fact, deliver our promises and exceed expectations. Do this and we can build on our customer relationships, rather than churn through prospects that we should have never sought out. Messaging: Knowing our market segment and how our customers perceive us begins to define our core essence. (Our core business is what we think we provide our customers. Our core essence is what our customers think we provide them.) Understanding what our customer expects from us helps define our message�our value proposition. If this can be defined, our message can be loud and clear. We will truly be providing solutions and be valued by our prospect. Without this, barter can be a blur of misunderstood options and processes that eventually erode the customer benefit. And hence, continue to drive us toward continuing to prospect in areas where we have no business. Medium: I don�t believe the barter industry has experienced great market penetration with traditional advertising. I would suggest that our industry is ripe to experience viral marketing...creating a �buzz� generated by our customers. Again, a conclusion that should drive us to grow our business based on our current customers� needs. So, turn on the GPS and never get lost again! TeleTrade international announces through the first 11 months of 2008 for barter/trading activity that volume is nearly $80 million for worldwide transactions through its online platforms for independent trade exchanges. The total of all online activity since 1999 when TTi took its technology online now exceeds 642 million. The eValues system for independent barter/trade exchanges reflects nearly 50 million in transaction volume during this period. EValues online totals reached an activity level of almost 356 million since coming online in 2000. TTi has its swipe-card terminal technology program available to all U.S. based exchanges, and can create a system for local exchanges worldwide to have this capability. 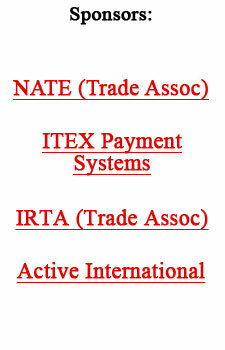 For the U.S. exchanges, TTi has been able to secure a relationship with the country�s fourth largest private merchant service provider to give participating exchanges the �guaranteed lowest credit and debit processing rates.� From a single terminal, merchants have the combined ability to process credit, debit, discount, and barter programs. For more information contact CEO Gary Lasater at (303) 840-7172 ext 1, or gary@teletrade.net. German Sterligor, 41, is promoting an electronic barter idea for commodities, that he claims could save Russia�s foundering financial system. Sterligor made his first million at age 24 but exited from the high life when he challenged then-President Putin in his 2004 re-election bid. At the time he was a tycoon with hundreds-of-millions of dollars in the bank, dozens of businesses, offices on Wall Street and in London, and a villa in Rublyovka, a Moscow suburb for the super-rich. Now, living on a farm outside of Moscow, he along with a former business associate have set-up an �anti-crisis commodity transactions center for commodity bartering.� It�s an electronic substitute for money that�s not linked with the dollar, euro or ruble.